washed both mine today, they dont half make a racket in the sink, singing and burbaling as they clean up there scales. got one body together, and slowly following the instructions, the plan is to fill it in a bit, then wile its hardening do the same on the second one. Ive had to take over the diningroom table for this as theres absolutly no way theyd fit on my normal modeling desk. Just don't pin it to the dining table. with the body set, the neck will support itself as a dry joint with no fettaling ! The upper horns on the head also self pin and hold, which made decideing which set, so much easyer... do you prefer this set dear? or ( qucik swap) this set? well im a good bit further on, im waiting for the urrent set of greenstuff and superglue to set. necks arrached and blended, legs are attached to the body and base, and blended, both arms are on the tree holding one blended the outher needs blendong at the sholder, the 2 resin tail parts are pinned and attached but still need blending. The heads done and the horns are on and blened but not yet on the neck. Ive dry firtted the wings a couple of time and they look like theyll pretty much fit without any tweeking needed. Im still looking at the whole thing ( and the prospect of doing anouther ) and going . this one will be for sapphire penguin, so its for white primer, and shes still saying Purple! number 1 is finished, puttied, and undercoated, Sappire penguin will be starting on painting it soon. Ill be starting number 2 soon. The company making the deeper mould tin has promised me it will be delivered Monday. Then again they promised it would be ready before Christmas, and before that they promised it would be the right size. Hey Andy, how about sculpting a little hobbit to go with him as a thankyou for all of us who've been patiently waiting this long? I wonder how easy it would be to paint the Heresy zombie halfling as a charred husk. Here you can see how I've re-cut the parts so that they can be spincast. The bits that aren't in metal in that pic are what I'm intending to mould and cast in metal next week assuming all is fine with this new tin, due to arrive tomorrow (i'm assured it is the proper size this time. Fingers still crossed). 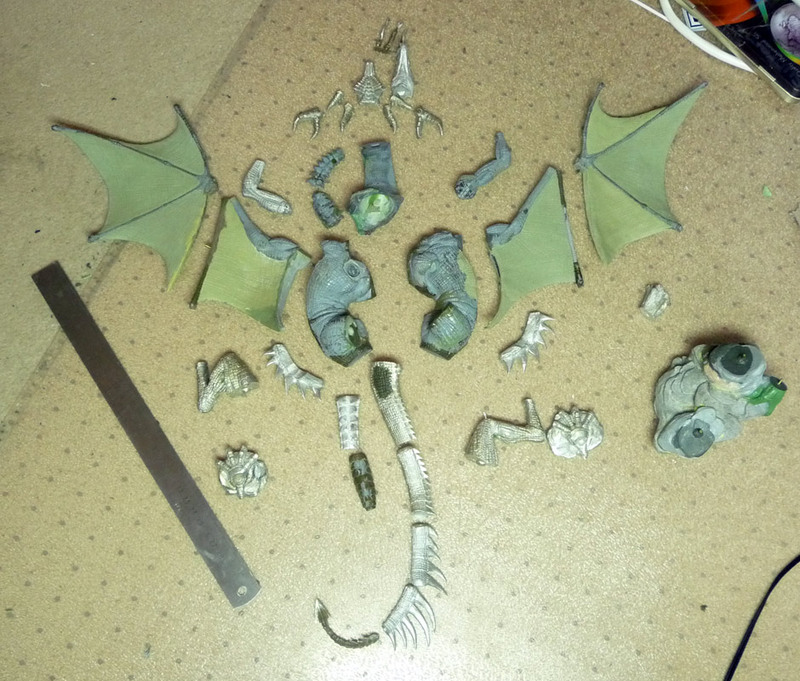 Then once I've got a good set of castings - which willuse every erg of metal I've got in my various tubs of other masters) it's a case of cleaning them up, making sure that everything fits together and any deformities etc are filled in (like on the tail, where you can see a large patch of fresh scales covering an area that for whatever reasons of heat etc, sank away from the mould rather than casting properly.) Then I can send those masters off to Ed Fortae in the USA and find out how much it'll cost to get the queue sorted out once and for all. The rock is going to Ian at Fenris - too big to spincast, it's about four inches thick. whoa! it looks evan bigger there andy! good luck with this, you realy deserve to catch some. Sounds like they sent the right size this time then. 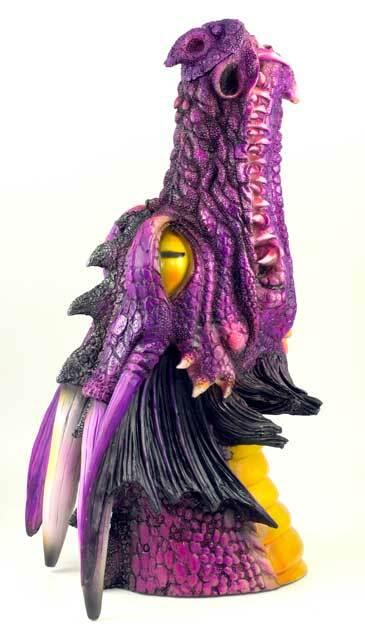 Really should assemble + paint my dragon this year. Started cleaning the big bugger a while ago but then there was always something else to do (dementia and dragons don't go together too well).